Wondering what are some of the best destinations in China? If you are traveling to China for the first time, Beijing is a great place to begin a visit to China. Popular attractions and places of interest in China include the Forbidden City and the Great Wall of China. To get the best experience of the Great Wall of China, head towards the area of 'Badaling Great Wall', as the area features a cable car and it is one of the best originally reconstructed sections of the Great Wall. The Forbidden City is a beautiful Royal Palace which is now turned into a museum that features a myriad of interesting artifacts. Two other popular attractions in Beijing are the Temple of Heaven Park and the Beijing Zoo where you can see the famed Pandas. Shanghai is the largest and one of the most modern cities in China and the place where you will find the country's skyscrapers such as the renowned Oriental Pearl TV Tower. If you intend to do some shopping during your trip to China, Shanghai is actually one of the best places to experience the shopping scene in China. Shanghai is home to, Nanjing Dong Lu, which is the largest and busiest shopping streets in the whole of China. On Nanjing Dong Lu you will find the popular Dongjiadu Cloth Market which is filled with street vendors that sell satin, cashmere and silk goods. If you are interested in souvenir shopping, the Shanghai Old Town, located on central Fang Bang road, is home to many shops where you can find charming Chinese figurines. If you are looking to learn more about China’s rich history, the city of Xi’an is one of the best destinations in China for those of you interested in ancient China, as it is home to the first Chinese Emperor. 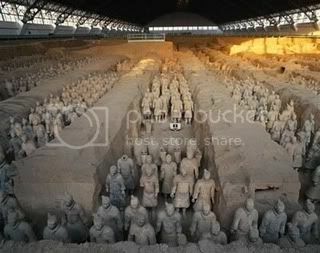 Xi’an is also home to the popular UNESCO Heritage site of the Terracotta Army. At the Terracotta Army archeological site, you can see over 5,000 Terracotta Warriors and horses in battle formation, as well as the resting place of the first Emperor of China. Huaqing Pool is another popular attraction to visit in Xi’an town and it is located on route to the Terracotta Army site. Huaqing Pool actually consists of many ancient hot springs (pools) and gardens where you can enjoy a peaceful stroll and marvel at the beautiful statues and buildings there. Two other landmarks worth checking out in Xi’an include the Drum Tower and the Bell Tower. In particular, the Bell Tower, is a must-see attraction as it is home to traditional Chinese paintings, and it also features musical performances with the bells. For those of you interested in the great outdoors and natural scenery, the city of Guilin is one of the best destinations in china for outdoor enthusiasts, as it is home to stunning peaks and remarkable natural formations. One of the most popular scenic sites in Guilin City, it’s the Duxiu Feng peak which is home to the Duxiu Feng Pavilion. This Pavilion is beautiful to marvel at, and it offers a great view point from where you can get stunning views of Guilin City. Another popular attraction to visit in Guilin City is that of Elephant Trunk Hill which is located inside the park along Li River. The Elephant Trunk Hill is a popular landmark and one of the most remarkable natural formations in China, as the hill resembles the head and trunk of an elephant drinking water, when looked at it from the distance. Elephant Trunk Hill is also home to caves such as the Water Moon Cave where you can see Chinese poems carved in the walls.